The 8:30 service would be our traditional option-- ancient creeds of the church, communion every Sunday, passing of the peace, hymns from the hymnal and The Faith We Sing, all beginning with a Moment of Meditation written by a lay member of the church. 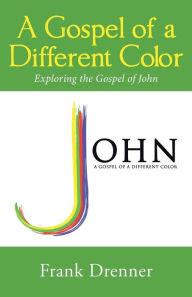 11:00 service would be a blended service, but with a modern beginning of the service: darken the lights when we remember to do so, two or three seamless praise songs, leading right into scripture and sermon. Greeting times would be three minutes before and after worship and there would be a children's message. We needed a new option. A service intentionally designed for younger generations, with a less formal atmosphere, more like a coffee-house setting. It would feature tables and everything a table implies: a meal, sharing life experiences, building community. Music will be similar to 11:00, also lead by Lori and Anthony Hartman. My sermons will use the same texts as Sunday, but will be shorter-- more of a devotional. There will be time to discuss and reflect following the message. 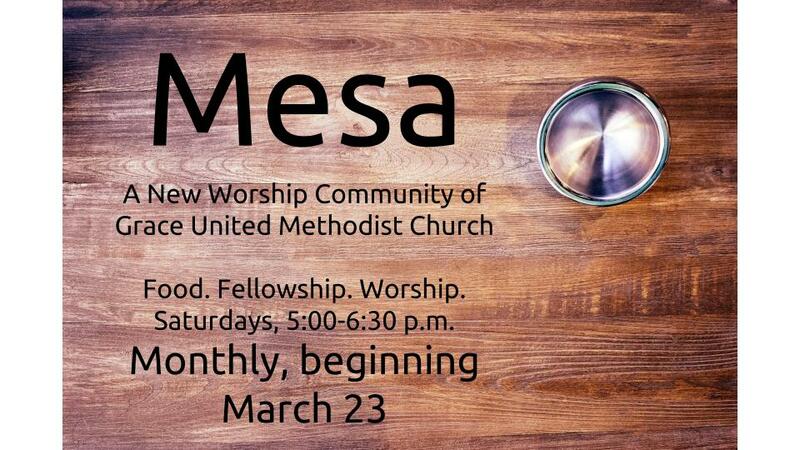 Our working title for this new experience is Mesa, the Spanish word for table. 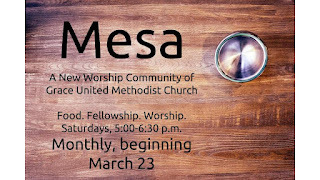 It will meet monthly, with preview services March 23 and April 20 (Holy Saturday; this will be an Easter service, but the night before). Time: 5:00-6:30 p.m.
We've been sharing the word about this new opportunity on social media; there will also be cards to use as invites for people you may know who are looking for a new expression of church. The service is one of many New Spaces for New Faces, the initiative of the North Texas Conference last year. The Conference even gave us some grant money to use for food and advertising as we launch. Pray. We want to create a space to reach a new generation beyond the current reach of the church. Invite. Even if that only means sharing the graphic on Facebook. Attend. It will have a different feeling than what you are accustomed to. Many familiar aspects of worship will be missing. But the goal here is not to move people from Sunday to Saturday. If you know you'll miss March 24 and would go without worship unless you attend on the 23rd, go for it! Listen. Even if current Grace folks really dig Saturday, our goal is for young and unchurched folks to find a home for God there. We will listen to them closely, in terms of the direction of the service. Support. Even if you never attend, lend your prayers, your financial support, your openness to new people. Be positive and encouraging, even if what you see and hear about Mesa doesn't suit you. Grace UMC is such a unique, loving place, and we want to increase our impact and reach.